NETWORK UPDATE: HAWAII 5-0 lost another 0.1 in final Friday numbers. SHARK TANK was up 0.1. GIRL MEETS WORLD (Disney) lost 0.09 from last Friday but still topped this week’s very quiet Friday cable originals at 0.63, with lead-in JESSIE down 0.06 to 0.35 and lead-out DOG WITH A BLOG at 0.39. Syfy’s WWE night dropped 0.15 to 0.62 for 2d place, and the same network’s Z NATION lost 0.12 to a series low 0.38. BERING SEA GOLD (Discovery) was also down 0.12 to 0.42, and its lead-out AIRPLANE REPO fell 0.05 to 0.38. 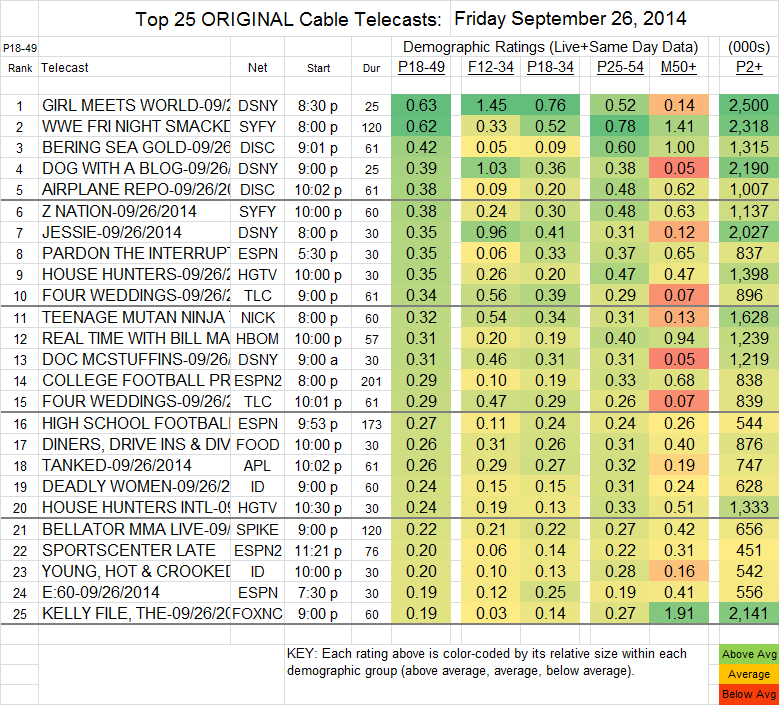 HBO’s REAL TIME WITH BILL MAHER was one of the few shows to register an increase, up 0.04 to 0.31. THE KNICK (Cinemax) ticked up to 0.12, and held steady with 358K total viewers.